Building natural shelters is fairly easy. It’s an innate, or quickly learned, human ability. With some basic training and a bit of perseverance, most of us can gather materials from the environment and produce sheltering structures that are not only physically sound, but even ones that are often elaborate and quite stunning. This link will take you to some great examples – and again, ones that are within the reach of nearly all of us. But erecting modern natural buildings is another matter, and a far more complex undertaking. And this is especially true when we define modern natural buildings as not just using natural materials or working with natural landscapes, but also as being wholly or partially off-grid, or having some degree of autonomy or independence from traditional – and unnaturally centralized – utility systems (see Wikipedia Autonomous Building). 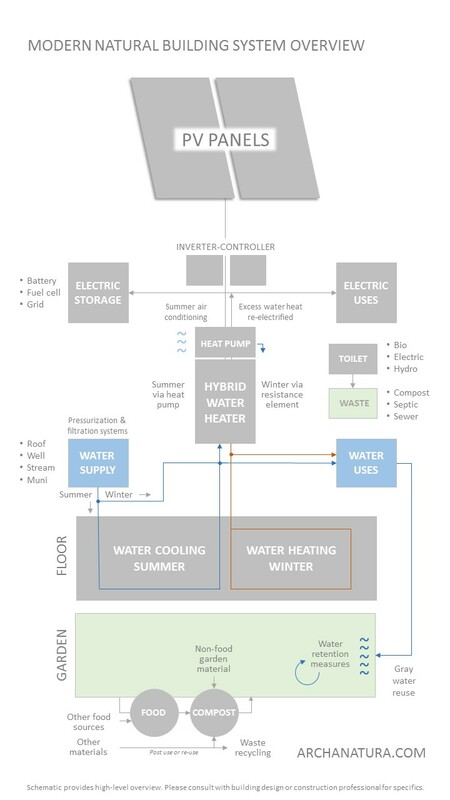 In practice, the at once old and new demand of building autonomy often requires far more careful consideration of the building’s mechanical systems than in the case of utility-connected buildings. Unless our budget is unlimited and we can tolerate significant inefficiency or redundancy, autonomous building today almost invariably involves a fairly intricate weaving or orchestration of a building’s mechanical systems. Of course, the primary driver of the added complexity of modern buildings, at any level of autonomy, is that we ask all modern buildings – whether serving as homes, businesses, or for other uses – to do more than simply shelter us. We want or expect modern buildings to heat, cool, and light our lives. We expect they will keep us and our possessions safe, and even warn us of threats and hazards – from outside the building and within. We expect modern buildings to power our appliances and tools, and to aid our modern lifestyles more generally. We want our buildings to advance our goals, to make occupants and visitors comfortable, and to fulfill social mores and expectations. And we expect many buildings to be at once restful and enlivening places, settings where we can renew or enjoy ourselves amid the complexity and demands of modern life. It’s a long list of essential building features for many, if not all, of us. And it is the complexity of modern building, and especially modern natural building, that tends to keep it out of reach for a great number of people. But this needn’t be the case. As I work to showcase through ArchaNatura, modern natural building can be greatly simplified and put within the reach of people of modest means, or ones dedicated to more natural, dematerialized, and intentional life.